I’ve always been a fan of the DK Eyewitness Travel series of books – the guides that I own for Egypt, Canada and London were invaluable during my travels. Now, Dorling Kindersley have launched their first Eyewitness Travel title for the tech-savvy traveler with the release of Eyewitness Paris for iPad. The Eyewitness Travel series have been designed to “show you what others only tell you”, and it’s a fitting description. Eyewitness Paris is a truly visual affair, with interactive illustrations and cutaways of the major sights in Paris: Notre-Dame, Musee du Louvre, Eiffel Tower, Arc de Triomphe and more. Points of interest are indicated on famous attractions, as well as on beautiful hand-drawn maps, which enable you to explore in more depth, with additional information and images accessible with a single tap. The “Paris in Pictures” section features a huge number of high-resolution photos, each with a one-button option to show the location on the map so it’s easy to find when you’re planning your exploration of the city. “Eating and Drinking” and “Where to Stay” offer practical tips, as well as an area-by-area breakdown of the best places to eat and find accommodation, for all budgets types. A final section on the History of Paris gives an abridged guide to the fascinating history of one of the world’s oldest cities, from Gallo-Roman times, Medieval and Renaissance periods through to Napoleonic and modern Paris. 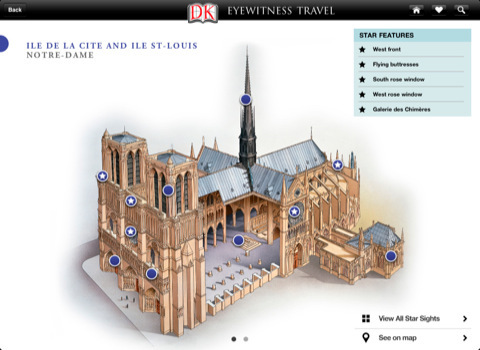 Whether you’re planning on a visit to the City of Lights or are just interested in learning more about the French capital, DK Eyewitness Paris is the only guide-book you’ll ever need. The only fault that I can find with DK Eyewitness Paris is the price, which at $16.99, is not unreasonable, but offers no discount over the print version of the book. 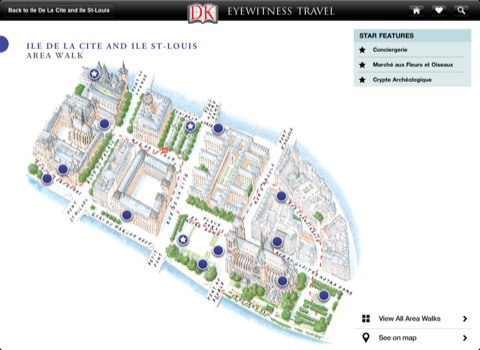 DK Eye Witness Travel is compatible with iPad only. Requires iOS 3.2 or later.